In the third book the line is extended to Yockletts Village. Peter and Grandpa tell Grandma that the extension is for her to go shopping, but they bank up the track so they can run the trains at high speed. Along the way the two heroes discover a long forgotten engine which they put back to work and Grandma has a hair-raising escape. To celebrate the opening of the new line, The Great Train Race is organised with lots of visiting locomotives. Who will win? 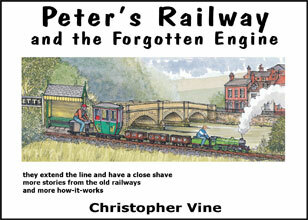 There are another 14 pages of simple technical diagrams, explaining how railways and engines work. Some of the drawings are familiar from the first two books, but the science and engineering explored is different. If the reader has enjoyed the technical information in books one and two, they will find this book takes them further. Hardback, 30 watercolour pictures and 14 pages of simple technical drawings.